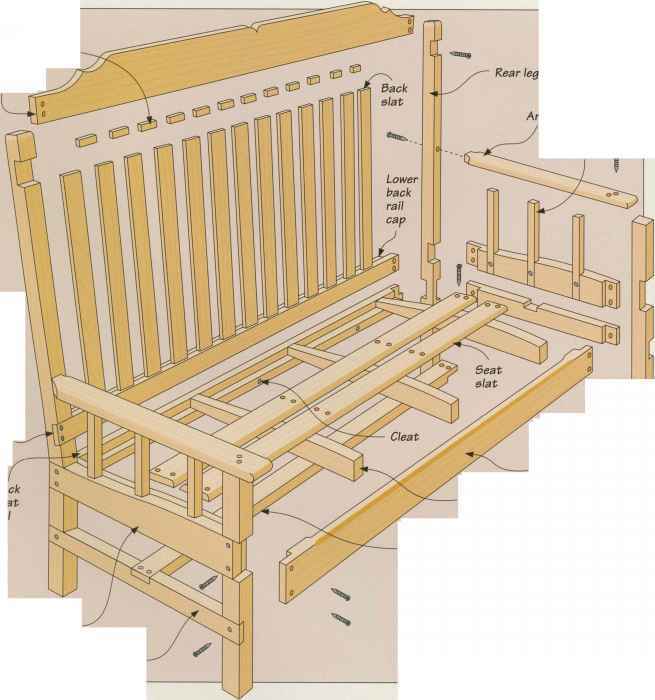 Use the holes you used to secure the template (page 39) as guides to bore clearance holes for the threaded rod. Start by clamping a plywood backup panel to your drill press table and install a '/-inch bit in the machine. Position the unit on the table so that one of the holes is aligned under the bit and hold the unit steady as you drill the hole (above). Fit your drill press with a 1%-inch-diameter hole saw to cut the spacers that separate the chair units. Make the spacers from two boards—% inch thick for the front spacers and inches thick for the rear ones. Hold the board on the machine table and cut through the stock, lowering the feed lever slowly (right). At the same time, the hole saw's pilot bit will bore a hole through the center of each spacer for the threaded rod. Once you have cut enough spacers, you can begin assembling the chair. Start by feeding the three threaded rods through the holes in one end unit and anchoring each with a nut and washer. Set the unit inside-face up on the shop floor and slip a spacer onto each rod, using longer spacers at the back and shorter ones at the front. Next, fit a chair unit onto the rods and press it firmly on the spacers. Continue adding spacers and chair units (left) until the last unit is in place, then install a washer and nut onto the top end of each rod. Close any gaps between the spacers and the chair units. Hand pressure should suffice at the back of the chair; use a wrench to tighten the nuts. 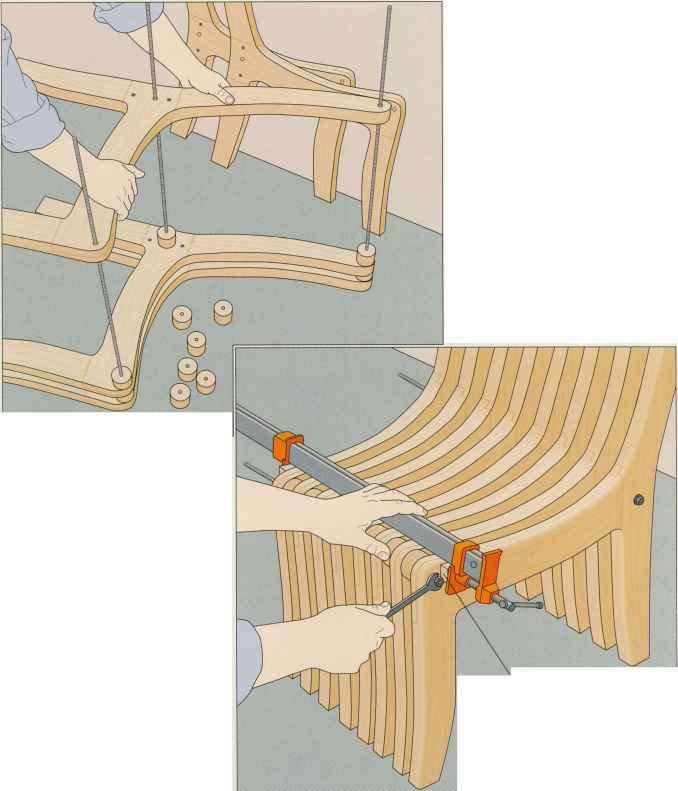 At the front of the chair, install a bar clamp across the seat and tighten it as necessary to close any gaps; protect the stock with wood pads. Tighten the nuts at the front of the chair (right), then give all the nuts a final tightening. Remove the bar clamps and use a hacksaw to cut the excess rod flush with the nuts. Cover the nuts with wood caps fashioned from short lengths of 1-inch dowel.